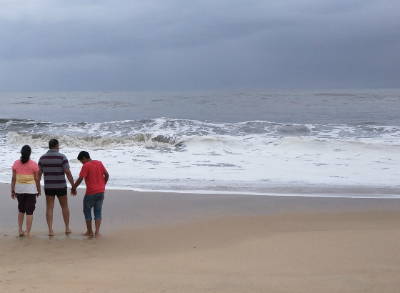 Dad, Kunjunni, Kunji chechi and I held hands as the waves crashed on the shore. We could hear the roaring sound of the sea and feel the sand beneath our feet. The cold water pooled around us until we were hip-deep, before rushing back. The private beach was a beautiful one. The horizon stretched on with nothing interrupting its flow. No other people, not a single footprint. There was a breeze and everything was serene. Turtle Beach resort had plenty in store for us. But we were going back home in the evening so we couldn’t try out everything. My parents had arranged for a taxi to drive us in the morning, along with Kunjunni and Kunji chechi, to the resort. Valyamma and Valyachan would join us later. At the resort, we could hear the faint sound of roaring waves at the beach, which proved to be just too good to resist. Mom chose to stay out of the fun and watched us instead because a) she didn’t want to get wet and b) the waves were so huge anyway. “You won’t get washed away if a wave hits you” Dad said, but Mom refused to budge and stood under a coconut tree with her umbrella. When we were done splashing around, we went to our hut. The backyard had two hammocks and Dad and Kunjunni leaped on them immediately. Kunjunni fell out of his hammock when he tried to lie on it the first time but scrambled back up quickly. Valyamma and Valyachan arrived to see him smiling peacefully up at the sky with his hands behind his head. After lunch, we hit the swimming pool. Valyachan, Kunjunni, Dad and I swam around and the others watched us while sitting on the pool chairs. The four of us tried to see who could hold their breath underwater the longest, and Kunji chechi timed us. Dad, being the best swimmer won. Kunjunni and I had goggles on. When I looked at him next to me underwater, he gave me a wave before tickling me, so I came up first, gasping and glaring. We went to see ‘Finding Dory’ at Lulu. We all went “Aww…” on seeing Dory when she was just a fry. Okay, now that sounds plain weird. Dad had only come for a week’s time and he left yesterday. It’s back to the normal routine.